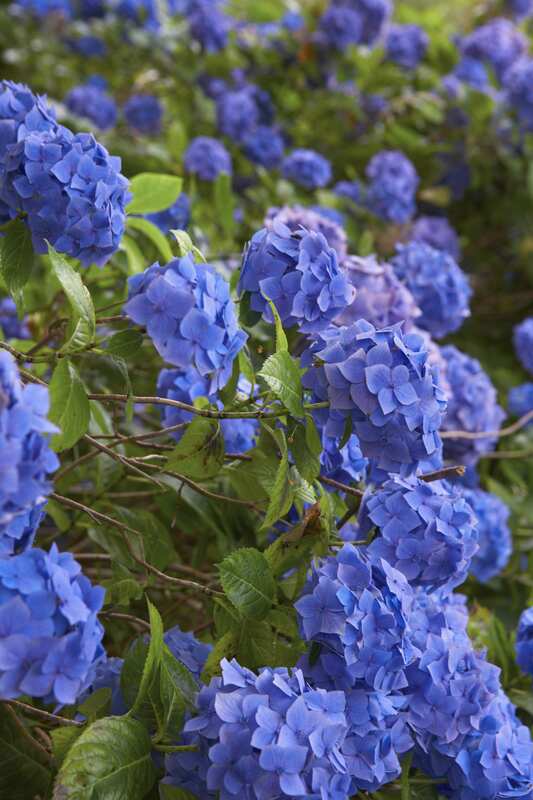 Let us talk about the fabled Blue Hydrangea, to some more desirable than the golden fleece, as sought after as the holy grail. Each year at the local flower show there is a category for Best Blue Mophead. This puzzles me. Actually a lot of what happens at the flower show puzzles me (although I love it really). Actually a lot puzzles me. Anyway let us not get distracted; my point is that the only requisite for growing blue hydrangeas as opposed to any other colour is that you must have acidic soil. Basically if you garden on alkaline soil you are stuffed. No matter how skilful a gardener you are you cannot avoid this fact. So to all those who say “I am desperate to grow blue hydrangeas but they always turn out pink” I would say, “Either move house or give up”. Don’t try to change the pH, don’t try to grow them in pots, don’t try witchcraft! You are fighting a fight in which you will always come second. This may sound a little defeatist, but some battles are worth the effort and some are not. By all means attempt to grow the Lesser Spotted Doddlewort from Outer Mongolia, take a crack at grafting a rose onto an apple tree, have a go at propagating the Amazonian Sky Fern, but do not try to grow blue hydrangeas if you have the wrong soil. Anyway what is so wrong with pink? Come on get in touch with your Barbie side! I am not proud. I have no qualms about taking other people’s images and using them to my advantage. In a bare face manner. Not even blushing. A friend of a friend and now someone that I might just tag onto and pretend he is an old buddy took this picture. He is a real life photographer, he has won awards, he has photographed Ralph Fiennes for god’s sake! And he makes a mean curry (allegedly). Do not panic ladies and gents, I do have his kind permission to use this photo. Really you should check him out, his name is Matt Anker, he is the real McCoy. You can then also say that you almost know him. Your posts always make me smile and sometimes chortle. Often useful after a rubbish Monday. I chortled, too! Giggled and grinned throughout. Thank you for that! So now I know! I may have to adopt Matt Anker, maybe he can stir some life back into my garden! Do you know, we have Hydrangeas here, but I can’t remember what colour they are! I have an idea they are pink. However, if your theory is right (and I am sure it is), then ours should be a lovely blue colour given how well things like rhododendrons ( a rose by any other name would smell as sweet, a rhododendron by any other name would be a darn sight easier to spell…) grow round here. I await with interest, and perhaps so does the village show next month.